There are many people in this world who try to trick others by hiding their real emotions. However, when the truth comes out, it can be kind of embarrassing, especially when the moment is broadcast across the entire country. This guy, Neil Entwistle, killed his wife and daughter in 2006. At the trial, he fake cried to attract public sympathy in the courtroom, and it completely failed. It seems that he does not know how to make a sad face, so let me show you how the actual crying face works. 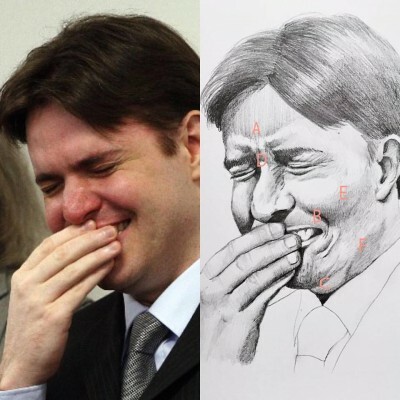 Clearly, he looks like he is about to smile or laugh in the picture on left, and in my illustration on right he looks like he is about to drop some tears. But, why? Let’s take a look at the details. Usually, when a person is having deep, negative feelings, you could see some kind of pressure in the face. The first pressure that you can focus on is in the forehead. If he is closing his eyes tightly and having emotional pain, the Procerus muscles and the Corrugator Spercilii muscle will be contracted. Therefore, shading would be created above the eyebrows and on the forehead (A). The corner of the lips is also an important part of a sad face. Imagine making a smiley face into a sad face. Would you keep the curve of the mouth as is? No, you would probably flip the happy curve 180 degrees vertical. That means that the corner of the mouth cannot be pulled up like in the picture on the left. It should be pulled down (B). This is a contraction of the muscle called the Depressor Anguli Oris. At the same time the Depressor Anguli Oris contracts, the Mentalis muscles make the chin tighter, and/or push up the lower lip. When this muscle is contracted, many random small bumps can be noticed in the chin area (C). Also, sometimes the lower lips are slightly vibrating when sadness occurs, and there could be more pressure around the neck and below the cheeks (F). (D), points at the medial section of the eyes and eyebrows. When a person feels either sadness, fear, or any type of pain, the shape of the eyebrow should start changing. The movement of the eyebrows cannot be seen much in the picture on the left, so I added a slight curve to it in my illustration. I also made the medial upper eyelids look like they are being pulled up a little. It is a small change, but you can see the emotion dramatically changed when it happened, right? Lastly, this one is going to be the most subtle movement in the face of sadness: it is the cheek! When you smile, the cheeks puff up and become like an apple, because the corner of the mouth is pulled up to the side. Sad cheeks are very tricky, because the muscles that contract during happiness, and the muscle that contract during sadness are right next to each other. Sad cheeks do not have a smooth roundness like an apple. They push up in a more tight way. That is why I flattened the cheeks and added a more steep shadow in my illustration (E). It makes it look like the cheek is a little tighter, and pulled towards the ground.